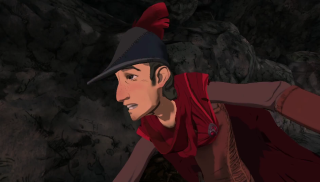 The re-imagined King's Quest being developed by the Odd Gentlemen under the auspices of Activision will boast an impressive cast of voices including Christopher Lloyd as the elderly King Graham, Zelda Williams as a no-nonsense blacksmith, and Wallace Shawn, the inconceivably brilliant criminal mastermind from The Princess Bride. The cast also includes videogame veteran Josh Keaton, Maggie Elizabeth Jones of We Bought a Zoo, and Tom Kenny, the voice of Spongebob Squarepants. The lineup was revealed today in the latest development diary video, entitled "Voicing a Modern Classic," which also shows off some pretty sweet-looking gameplay clips. The new King's Quest was revealed last year, but while it's pretty clear that it will be a light-hearted adventure in the same vein as the originals (although hopefully without all the sudden, surprise dying), Activision stated last August that won't actually be a point-and-click game. The first of five planned chapters is expected to be out later this year. Our own Wes Fenlon saw the game at GDC this year and it rekindled his love for the genre.